Allows for a vnl matrix to be a data object with the flexibility of being resizable. Definition at line 36 of file itkMatrixResizeableDataObject.h. Definition at line 43 of file itkMatrixResizeableDataObject.h. Definition at line 42 of file itkMatrixResizeableDataObject.h. 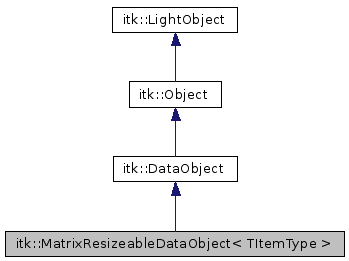 Definition at line 40 of file itkMatrixResizeableDataObject.h. Definition at line 41 of file itkMatrixResizeableDataObject.h. Reimplemented in itk::VoronoiDiagram2D< TCoordType >, itk::watershed::Boundary< TScalarType, TDimension >, itk::watershed::SegmentTable< TScalarType >, itk::watershed::SegmentTree< TScalarType >, itk::AutoPointerDataObjectDecorator< T >, itk::BloxBoundaryPointImage< TImageDimension >, itk::BloxBoundaryProfileImage< TImageDimension >, itk::BloxCoreAtomImage< NDimension >, itk::BloxImage< TBloxPixelType, TImageDimension >, itk::ChainCodePath< VDimension >, itk::ChainCodePath2D, itk::DataObjectDecorator< T >, itk::EquivalencyTable, itk::FourierSeriesPath< VDimension >, itk::Image< TPixel, VImageDimension >, itk::ImageAdaptor< TImage, TAccessor >, itk::ImageBase< VImageDimension >, itk::Mesh< TPixelType, VDimension, TMeshTraits >, itk::OneWayEquivalencyTable, itk::OrthogonallyCorrected2DParametricPath, itk::ParametricPath< VDimension >, itk::Path< TInput, TOutput, VDimension >, itk::PhasedArray3DSpecialCoordinatesImage< TPixel >, itk::PointSet< TPixelType, VDimension, TMeshTraits >, itk::PolyLineParametricPath< VDimension >, itk::SimpleDataObjectDecorator< T >, itk::SimplexMesh< TPixelType, VDimension, TMeshTraits >, itk::SparseImage< TNode, VImageDimension >, itk::SpecialCoordinatesImage< TPixel, VImageDimension >, itk::VectorImage< TPixel, VImageDimension >, itk::Statistics::MultilayerNeuralNetworkBase< TMeasurementVector, TTargetVector, TLearningLayer >, itk::Statistics::NeuralNetworkObject< TMeasurementVector, TTargetVector >, itk::Statistics::OneHiddenLayerBackPropagationNeuralNetwork< TMeasurementVector, TTargetVector >, itk::Statistics::RBFNetwork< TMeasurementVector, TTargetVector >, itk::Statistics::TwoHiddenLayerBackPropagationNeuralNetwork< TMeasurementVector, TTargetVector >, itk::ArrowSpatialObject< TDimension >, itk::BlobSpatialObject< TDimension >, itk::BoxSpatialObject< TDimension >, itk::ContourSpatialObject< TDimension >, itk::CylinderSpatialObject, itk::DTITubeSpatialObject< TDimension >, itk::EllipseSpatialObject< TDimension >, itk::GaussianSpatialObject< TDimension >, itk::GroupSpatialObject< TDimension >, itk::ImageMaskSpatialObject< TDimension >, itk::ImageSpatialObject< TDimension, TPixelType >, itk::LandmarkSpatialObject< TDimension >, itk::LineSpatialObject< TDimension >, itk::MeshSpatialObject< TMesh >, itk::PlaneSpatialObject< TDimension >, itk::PointBasedSpatialObject< TDimension >, itk::SpatialObject< TDimension >, itk::SurfaceSpatialObject< TDimension >, itk::TubeSpatialObject< TDimension, TTubePointType >, itk::VesselTubeSpatialObject< TDimension >, itk::BloxImage< itk::BloxCoreAtomPixel< NDimension >, NDimension >, itk::BloxImage< itk::BloxBoundaryProfilePixel< TImageDimension >, TImageDimension >, itk::BloxImage< itk::BloxBoundaryPointPixel< TImageDimension >, TImageDimension >, itk::ChainCodePath< 2 >, itk::Image< itk::BloxCoreAtomPixel< NDimension >, TImageDimension >, itk::Image< TNode *, VImageDimension >, itk::Image< itk::BloxBoundaryProfilePixel< TImageDimension >, TImageDimension >, itk::Image< TBloxPixelType, TImageDimension >, itk::Image< itk::BloxBoundaryPointPixel< TImageDimension >, TImageDimension >, itk::ImageAdaptor< TImage, itk::Accessor::AsinPixelAccessor< TImage::PixelType, TOutputPixelType > >, itk::ImageAdaptor< TImage, itk::Accessor::AbsPixelAccessor< TImage::PixelType, TOutputPixelType > >, itk::ImageAdaptor< TImage, itk::Accessor::LogPixelAccessor< TImage::PixelType, TOutputPixelType > >, itk::ImageAdaptor< TImage, itk::Accessor::ComplexToPhasePixelAccessor< TImage::PixelType, TOutputPixelType > >, itk::ImageAdaptor< TImage, itk::Accessor::Log10PixelAccessor< TImage::PixelType, TOutputPixelType > >, itk::ImageAdaptor< TImage, itk::Accessor::ExpPixelAccessor< TImage::PixelType, TOutputPixelType > >, itk::ImageAdaptor< TImage, itk::Accessor::AddPixelAccessor< TImage::PixelType > >, itk::ImageAdaptor< itk::VectorImage< TPixelType, Dimension >, itk::Accessor::VectorImageToImagePixelAccessor< TPixelType > >, itk::ImageAdaptor< TImage, itk::Accessor::RGBToVectorPixelAccessor< TImage::PixelType::ComponentType > >, itk::ImageAdaptor< TImage, itk::PixelAccessor< TInternalType, TExternalType > >, itk::ImageAdaptor< TImage, itk::Accessor::SqrtPixelAccessor< TImage::PixelType, TOutputPixelType > >, itk::ImageAdaptor< TImage, itk::Accessor::AcosPixelAccessor< TImage::PixelType, TOutputPixelType > >, itk::ImageAdaptor< TImage, itk::Accessor::ComplexToModulusPixelAccessor< TImage::PixelType, TOutputPixelType > >, itk::ImageAdaptor< TImage, itk::Accessor::ExpNegativePixelAccessor< TImage::PixelType, TOutputPixelType > >, itk::ImageAdaptor< TImage, itk::Accessor::VectorToRGBPixelAccessor< TImage::PixelType::ValueType > >, itk::ImageAdaptor< TImage, itk::Accessor::TanPixelAccessor< TImage::PixelType, TOutputPixelType > >, itk::ImageAdaptor< TImage, itk::Accessor::ComplexToRealPixelAccessor< TImage::PixelType, TOutputPixelType > >, itk::ImageAdaptor< TImage, itk::Accessor::RGBToLuminancePixelAccessor< TImage::PixelType, TOutputPixelType > >, itk::ImageAdaptor< TImage, itk::Accessor::AtanPixelAccessor< TImage::PixelType, TOutputPixelType > >, itk::ImageAdaptor< TImage, itk::Accessor::SinPixelAccessor< TImage::PixelType, TOutputPixelType > >, itk::ImageAdaptor< TImage, itk::Accessor::ComplexToImaginaryPixelAccessor< TImage::PixelType, TOutputPixelType > >, itk::ImageAdaptor< TImage, itk::Accessor::CosPixelAccessor< TImage::PixelType, TOutputPixelType > >, itk::ImageBase< ::itk::GetImageDimension< itk::VectorImage< TPixelType, Dimension > >::ImageDimension >, itk::ImageBase< ::itk::GetImageDimension< TImage >::ImageDimension >, itk::Mesh< TCoordType, 2, itk::DefaultDynamicMeshTraits< TCoordType, 2, 2, TCoordType > >, itk::Mesh< TPixel, VDimension, TTraits >, itk::ParametricPath< 2 >, itk::Path< double, itk::ContinuousIndex< double, VDimension >, VDimension >, itk::Path< unsigned int, itk::Offset< VDimension >, VDimension >, itk::PointSet< TCoordType, VDimension, itk::DefaultDynamicMeshTraits< TCoordType, 2, 2, TCoordType > >, itk::PointSet< TPixel, VDimension, TTraits >, itk::SpecialCoordinatesImage< TPixel, 3 >, itk::VectorImage< TPixelType, Dimension >, itk::Statistics::MultilayerNeuralNetworkBase< TMeasurementVector, TTargetVector, itk::Statistics::BackPropagationLayer< TMeasurementVector, TTargetVector > >, itk::ImageSpatialObject< TDimension, unsigned char >, itk::SpatialObject< 3 >, itk::SpatialObject< ::itk::GetMeshDimension< TMesh >::PointDimension >, itk::TubeSpatialObject< TDimension, itk::DTITubeSpatialObjectPoint< TDimension > >, and itk::TubeSpatialObject< TDimension, itk::VesselTubeSpatialObjectPoint< TDimension > >.